Dr Ebrahim, medical director at the London Sleep Centre and co-author of the latest review, published in the journal Alcoholism: Clinical & Experimental Research, said: "We should be very cautious about drinking on a regular basis. "One or two glasses might be nice in the short term, but if you continue to use a tipple before bedtime it can cause significant problems. "If you do have a drink, it's best to leave an hour and a half to two hours before going to bed so the alcohol is already wearing off." 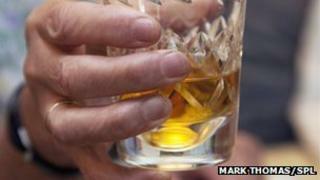 He said people could become dependent on alcohol for sleep. And it could make sleep less restful and turn people into snorers. "With increasing doses, alcohol suppresses our breathing. It can turn non-snorers into snorers and snorers into people with sleep apnoea - where the breathing's interrupted." From the hundred or more studies that Dr Ebrahim's team looked at, they analysed 20 in detail and found alcohol appeared to change sleep in three ways. Firstly, it accelerates sleep onset, meaning we drop off faster. Next, it sends us into a very deep sleep. These two changes - which are identical to those seen in people who take antidepressant medication - may be appealing and may explain why some people with insomnia use alcohol. But the third change - fragmented sleep patterns the second half of the night - is less pleasant. Alcohol reduces how much time we spend in rapid eye movement (REM) sleep - the stage of sleep where dreams generally occur. As a consequence, the sleep may feel less restful, said Dr Ebrahim. Chris Idzikowski, director of the Edinburgh Sleep Centre, said: "Alcohol on the whole is not useful for improving a whole night's sleep. Sleep may be deeper to start with, but then becomes disrupted. Additionally, that deeper sleep will probably promote snoring and poorer breathing. So, one shouldn't expect better sleep with alcohol." The Sleep Council said: "Don't over-indulge. Too much food or alcohol, especially late at night, just before bedtime, can play havoc with sleep patterns. "Alcohol may help you fall asleep initially, but will interrupt your sleep later on in the night. Plus you may wake dehydrated and needing the loo."